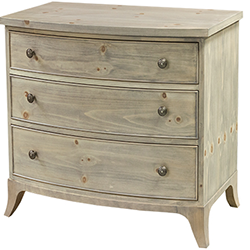 This piece features a bow-front shape accented by refind bead molding surrounding all three drawers. The Knotty Pine veneers and Pine cone knobs create a distinct reference to the Carolina Sandhills. The legs are flared and tapered. A bronze Putter Boy medallion is added to the top drawer. The Pine cone knobs in Pewter are standard. Bronze knobs are also available upon request. Dimensions: Width: 34", Depth: 20", Height: 29"